Orienteering isn’t everyone’s cup of tea and I hadn’t expected much of a response when I lobbed one of my periodical e-mails onto the list promoting a local event. It just made it all the nicer when first Nigel, Jan and then Shaun and Ros turned up at Cong Burn on a sparkly sunny cold winter’s Wednesday in January. This was an army event so were only three courses on offer and Jan and Nigel were going for the hardest one (Blue) while Shaun was approaching with more caution and opting for the middle course (Light Green). Shaun’s logic being that he didn’t want to end up doing so badly on Blue that he never wanted to do another event again. 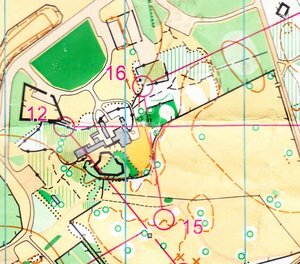 I’ve said many times that Orienteering events are surprisingly daunting when you first turn up because they seem a bit complicated and everyone else seems to know what they’re doing. In an army event like today there are also a lot of soldiers with racing vests that often include words like ‘rifles’ and ‘lancers’ somewhere. Which doesn’t help. 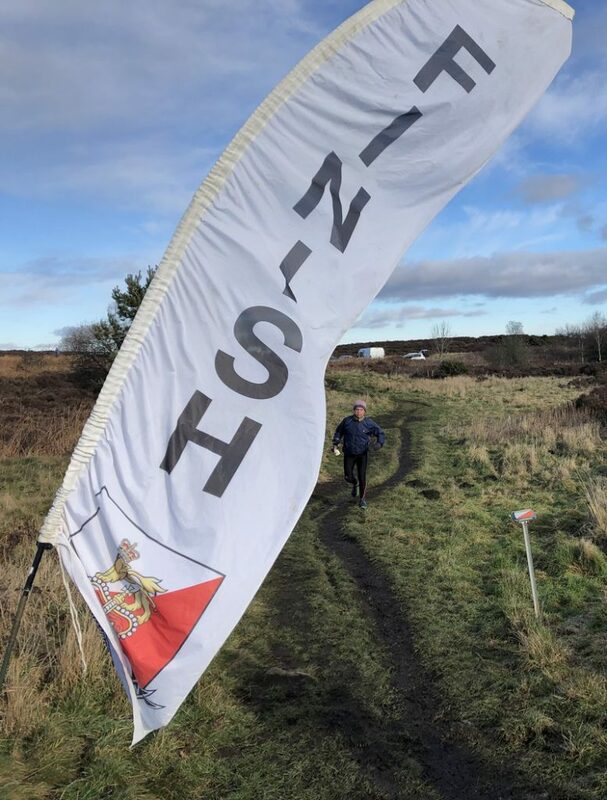 Even our neighbouring orienteering club Newcastle and Tyneside Orienteers are more often known by their acronym NATO. Jan was a bit nervous so I suggested just treating it like an interval training session. A bit of fartlek. Which is basically what orienteering is. Speed work where the speed, effort, intensity and duration depends largely on how good you are. The worse you are, the better and longer the workout. Staggered starts can sometimes make these sociable events surprisingly unsocial. By the time I’d got myself registered, organised and to the start the others had already gone. Shaun had been miffed to discover that you don’t get a look at the map with the course on it until the watch has started. I always advocate sprinting around the first corner, hopefully in the correct direction, in a purposeful manner, then as soon as out of sight of the start, stop and have a proper look. Although nowadays I’m a bit more relaxed and sometimes my starts involve a lot of Not Moving until I’ve had a good at where I’m going and got something approaching a plan. Conditions were great for orienteering and the ground was crispy and lovely to run on. I’m not ashamed to say I was well chuffed to discover I’d caught Nigel and one of my NN clubmates Bob Cooper around control 6. Mindful of a similar experience with High Cup Nick 10 years ago I didn’t allow myself to get overconfident. Nigel had fluffed up control 3 and lost a lot of time. Orienteering is like that. One bad control and you can haemorrhage time away. When it happens early in a race you have to give yourself a bit of a talking to as it’s easy to lose enthusiasm for the rest of the course. What would you do? It’s not a long leg, only a couple of hundred metres direct. I’d already forgotten my advice to myself about over-confidence and decided by far the best and quickest way was to drop down to the beck, leap it like a gazelle and a quick lunge north would take me to control 9. I noticed Nigel had decided to stick to the path and take the long way round. I didn’t see Nigel for the remainder of the course. He remained ahead of me while he gradually got more into the groove and his split times steadily improved. What I did see from my vantage point of knee deep in a disgustingly brown (I hope it was peat) marsh was a slow scrub where Jack Frost had decided not to tread leaving it perfect for energy sapping trudging. Good practice for Allendale I guess. Although the time lost wasn’t a lot these mistakes tend to dent your confidence and you either compound things by running about in a panic or slow yourself right down and collect your thoughts. Since my legs were wet, cold, and a disturbing shade of brown, and the only things flapping were my shoelaces I decided to notch things back a bit and had a fairly uneventful few controls where I got warmed up again and into the adventure. Control 13 to 14 brought the next interesting challenge. What would you do? The temptation is to contour directly along the steep south-east bank or to climb up and run along the road. In my experience with this sort of leg if there’s easy running further away it’s best to take the long-way round. I crossed the bridge and had an easy run along to the bottom of the bank at 14, back across the beck and up to the fence. The fence rather obligingly had a stile and a proper path on the other side so I hopped over and ran alongside the inside where it was easier while looking for the control. It was a good clean leg and I was pleased with myself. I didn’t notice at the time but the red vertical lines on the map show that this area is clearly out of bounds and I, along with half the army, had taken the inviting path on the OOB side of the fence. In the grand scheme of things it made little difference to my time but I was annoyed at myself for not noticing and had this been a big event and I’d been spotted it would’ve been an automatic DQ. But few people noticed and it’s not as if I’m going to write about it on the internet or anything. 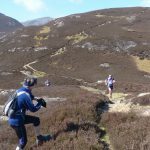 The remainder of the course was reasonably straightforward but the planner had made good use of terrain forcing competitors over a wide variety of challenging terrain and vegetation. I finished and back at download I found Nigel having a cuppa where it soon became apparant Jan and Shaun were still out on the courses. We walked back out onto the fell and into the sunshine where we could get a commanding view of runners finishing. Like battlefield commanders we surveyed the surroundings and speculated where Jan and Shaun might be. Shaun was first to finish getting doggedly round all the controls. He had been frustrated by his Garmin’s auto-pause feature which interpreted every pause as an opportunity to stop recording so he was a bit unsure how long he’d been out. Jan kept us guessing but before we got to the ‘should we getting worried’ stage she showed up at the download area. We sent her packing to the Finish which she’d decided to skip, then come back to download. It was largely academic though. Jan had a duff dibber that hadn’t flashed at any of the controls she’d visited. And the controls she had visited had been in an order of her choosing. Of all the tips I thought of offering before the start, visit the controls in order hadn’t been in there. Perhaps I should have though. I had a similar conversation out on the course with Sue and Kerry at the Durham City Night championships in 2015. If your experience of orienteering has all been score events, and no one has told you otherwise, you could be forgiven for thinking that order is optional. I’m used to being the only Strider at these events so it was lovely afterwards to head down with the Strider platoon to the Tea Barn and investigate the coffee and cakes and indulge in a bit of data analysis. This was an event where there were often varied and quite different route choices between controls. Not necessarily better or worse than each other. But always with consequences. 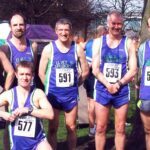 This event was part of a league of orienteering events run by the British Army Orienteering Club. The Military League North (MLN) have two more fairly local events coming up that are open to civilians. Plessey Woods on Wed 13th Feb, and Warcop (no details yet) on Wed 27th March. I wasn’t surprised to get no takers for my offer of a lift to Marne Barracks for a bit of orienteering. However, a last minute check of the email and I saw that Paul had decided to accompany me on this drizzly Wednesday for a trip down the A1 to run around an abandoned airfield. We were somewhere south of Scotch Corner and we’d pretty much solved all of the world’s problems when I noticed the road noise through the roadworks was a bit excessive, and it seemed to be a bit bumpy too. A minute or two of this and I realised that this was just one possible interpretation of the noise and bumps that were hitting our senses. 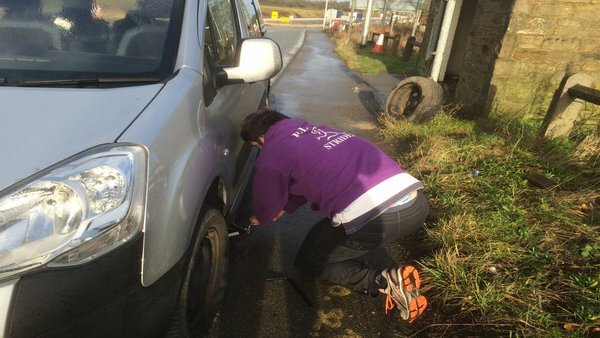 Another interpretation could be that we had a puncture. Yes, the more I thought about it, the more the puncture scenario seemed to fit the evidence, and driving along in a state of denial wasn’t going to change the facts. We pulled off the A1 and had a look at the tyres. One of them had a flat bit at the bottom and I knew that wasn’t good. I contemplated calling the AA but, despite being ok for time, wondered how long they’d take to attend a scene for two blokes too feeble to change a wheel. I mean, it couldn’t be that difficult, could it? I’m sure I’ve done it before. The first step was finding the spare wheel. We found it, eventually, under the back bit where I always assumed the fuel tank was. Trying to get the wheel out was a different manner. As an IT technician I then did something that pained me greatly, I had a look for the manual. I’d already tried switching the engine off and on again but that hadn’t helped. We got there eventually, except for the small matter of the jack, which we eventually found in a cubby hole in the car that I never knew existed. We were unstoppable now. A false start where we started trying to jack the car on one of the crunchy bits rather than the proper tough bit, but soon we were cruising. Well, I say we, it was mostly Paul. It had started raining so I spent most of the time standing in the bus shelter taking photos and making encouraging noises. Back on the road and into Marne Barracks, where passports were shown, disclaimers were signed, and we were driving slowly down the old runway looking for somewhere to park. Speed bumps on a runway, no matter how obviously disused, are an incongruous sight. The last time I orienteered here registration had been at the end of the runway out of a transit van. This time it was inside a nice building, with toilets, drinks, warmth and a costcutter. It seemed a shame to go outside again. Paul and I were both doing the same course and I went of first with the organisers observing a strict 90 second interval between starters. The first few controls were around the buildings and access roads and navigation was easy, and by the 3rd control I’d already been caught by the guy starting after me, which was pretty depressing. Then out into the woodland and the navigation got a bit more interesting. I bumped into Paul a few times which, given that he started about 6 minutes after me, meant two things. One, he was running a lot faster than me, and two, he must be making a few errors otherwise I’d only have seen him once. At control 15 our paths crossed again and Paul sped of to the east, which, given that the control was due north, confused me a bit. I headed straight for the control, knowing that there was the small matter of a fence between it and me. Whether it was ‘crossable’ or ‘uncrossable’, I was about to find out. Thankfully it was the former, but Paul had decided to go for the fast long way round. We finished at the same time, which was handy, as Paul’s dibber had failed to work properly, and we could use my time minus the time that he’d started after me to work out his. The next army event is at Scarth Wood Moor, Osmotherley on Wednesday 10th Feb. It’s not somewhere I’ve orienteered before but it looks nice. I’ll be going if anyone wants to tag along. Must be good at changing wheels. Historians will puzzle over why scattered around the forests of England their feet keep crunching on pairs of reading glasses in ancient Sitka Spruce plantations. How did they get there? What circumstances would cause someone to drop a pair of glasses in the middle of a forest? The answer is simple. Orienteering. And the glasses are all mine. Approaching Hamsterley Forest for this rather intriguing Military League North orienteering event I stopped to watch the fog bumping its way along the valley floor. This could make for some very interesting navigation. However once registered and ready to go the problem was not fog but trying to tip-toe the few yards across the sheet ice to the start. I miss the old days of the 3-2-1 countdown to the start of an orienteering competition. You used to get a start time allocated and you’d get into the countdown pens in good time before it was your slot. It was an exciting build up to the race. And then there were the master maps. Red pens, and copying stuff. Happy days. Now you just go, you know, when you’re ready. When you feel like it. I registered my ‘brikke’ in the starting scanner and then I tiptoed gently across the ice and into the forest. I looked at my map and found the first control. It looked straightforward enough. Next I checked for the control descriptions to see what it was. I was in for a surprise. Instead of the English descriptions I was used to they were presented in some strange hieroglyphics that could be anything. Was it a Mexican on a bicycle? A smiley face? No, apparently it was a depression. 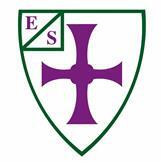 Having checked the University of Google I now know that these symbols are standard IOF control descriptions. I’ve never seen such things before and I think I have some homework before my next event. I lost my brikke at the first control and spent a few minutes scampering around trying to find a large red chunk of plastic that had blended in nicely with the woodland floor. Once found I made steady progress round the course, running hard when the opportunity presented itself, and resting when map-reading was required. Perfect fartlek. I wasted time at control 11, which was a knoll. It wasn’t a large steep brash-covered bank that loomed above the knoll, nor was it a stoney track running along the ridge, as I discovered as I stood at the top, and looked down at the text-book perfectly formed knoll that I’d clambered by and ignored. The knoll was a knoll shaped knoll thing, which might as well have had a comedy “knoll” signpost on the top just to make sure. I understand that things that walk and quack like ducks, may also actually be ducks. After 15 controls, 6 miles, an hour and 45 minutes and a maze of twisty forest paths (all alike), I sprinted back into the car park and looked for the Finish. I assumed it was the same place I registered but there seemed a queue. That seemed rather leisurely. 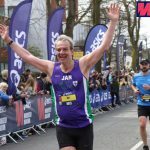 No one seemed to be sprinting anywhere in particular and I was beginning to feel a bit confused, so I asked another leisurely finisher where the finish was. “Back there”, he pointed, “on the bridge. You couldn’t miss it.”. No, of course not, I agreed, and once he’d turned away I did a 180 and sprinted back to the Finish and scanned my brikke. The finish was, indeed, easy to miss, just a modest banner and a bright red scanner. None the less I expected a half-decent result. I hadn’t got lost, ran hard where I could, and not wasted too much time on finding the controls. I looked at my results printout and ran my eye down to my position. 17th so far. Out of 18. 1 hour and 10 minutes behind the leader. Dougie, I thought, you’re in the army now.